A dural tear is a complication of spine surgery in which the thin covering over the spinal cord (called dura mater) is nicked by the surgeon’s instrument. Dural sac tears are nothing to mess around with. In their 2017 study, Chinese researchers assert that dural sac tears can lead to cerebrospinal fluid leakage, meningitis, nerve problems, and more serious conditions, as well. 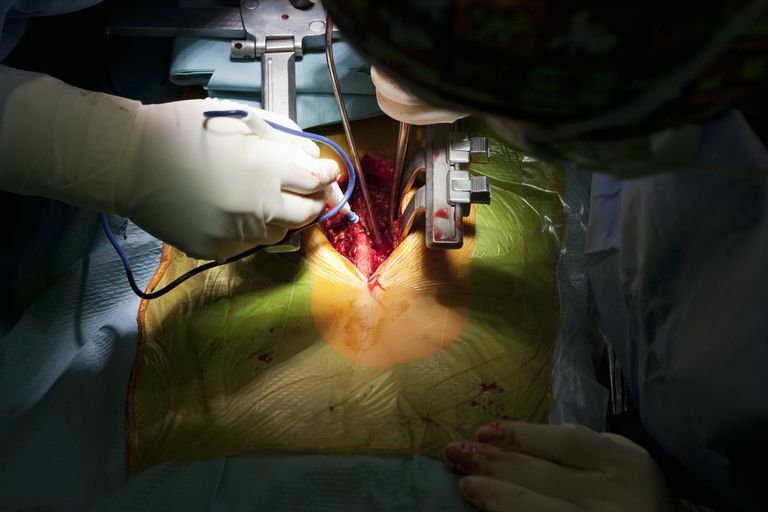 What Type of Spine Surgery Causes a Dural Sac Tear? The answer is, it depends. The Chinese authors identified a variety of procedures as possible causes. In general, though, dural tears tend to occur most frequently with revision spine surgery. Multi-level spine surgery is next on that list, followed by spinal fusion, and finally multi-level decompression (for spinal stenosis). Disc surgery and single level decompression surgeries tend to result in the smallest number of dural tears, relatively speaking. A peek at patient records published in the March 2016 journal Clinical Neurology and Neurosurgery found that dural tears presented themselves more often in people who experienced poor outcomes from spine surgery in which a synovial cyst was removed. In many cases such as these, according to the study authors, it is as though the dural tear foreshadowed the poor surgical outcomes. The Clinical Neurology and Neurosurgery authors also say that dural tears tend to happen most often at the level L5/S1. They also say that when only part of the cyst is removed, the patient is not at risk for a dural tear. While your doctor’s technique with the scalpel (or another instrument) may be what ultimately creates the tear, pre-existing conditions and/or deformities can increase your risk. For example, using steroids, having diabetes, or being a smoker all increase your risk. The same is true if you have certain spine problems, namely: spondylolisthesis, stenosis, scoliosis, or kyphosis. Dural tear is one of the most common complications of a back surgery. But many hospitals appear to be slow to report tears that occur in their institutions. For this and possibly other reasons, the incidence of dural tears may be underestimated. As it is, incidence rates reported in research studies vary widely. A number of things may account for differences: the reason for the surgery (stenosis, herniated disc, scoliosis, synovial cysts etc), whether the surgery was the patient's 1st, 2nd, 3rd, etc, and other factors. On the low side, a January 2011 study published in Neurosurgery examining over 108,000 spine surgery patients that found 1.6% of them experienced a dural tear. On the high side, Medscape reports that a 1989 study published in Spine calculated a 17.4% incidence rate of dural tears in a study population consisting of 481 people who underwent back surgery. The ICD-CM Coordination and Maintenance Committee (a committee that plays an important role in cataloging diagnoses) found that 57% of the hospitals they scrutinized underreported the incidence of dural tears. The committee asserts that 46% of the 2,446 hospitals reported no dural tears at all! It also asserts that the hospitals report treating dural tears, but they don't report the dural tears ever happening. And when the doctors doing spine surgery in many of these hospitals participated in clinical research studies (which are kept separate from the administrative reporting done by the hospitals), the incidence of dural tears was, in some cases, as high as 10%. The ICD-CM Committee estimates that these hospitals report only about half the dural tears that actually occur. As I mentioned at the start of this article, symptoms of a dural tear include cerebrospinal fluid leakage (called CSF leak). What does that look like? How can you tell if you (may) have a dural tear? Dr. Auerbach says if you have a CSF leak, you may notice a clear fluid discharging from your surgical wound. You may also experience position-related headaches that get worse when you stand up and that are relieved when you lie down. Other symptoms include visual changes, nausea, vomiting or dizziness, Auerbach says. If it's not treated quickly and properly, a cerebrospinal fluid leak can negatively affect your health. So symptoms such as the ones discussed above require prompt medical attention. All of that said, a dural tear is usually caught by your doctor during surgery and is treated right then and there. But late symptoms are possible, and in this case, it will be up to you to notice them and take action. If you experience any or all symptoms listed above, be sure to discuss them with your doctor as soon as you can. Treatments for dural tears include bed rest, draining, and if the leaking continues, surgery. The surgery for a dural tear is much like plugging a hole in a tire. As of March 2012, most dural tear surgeries involve sutures (stitches), but sutureless techniques are now being developed as well. Fang, Z., Treatment of Cerebrospinal Fluid Lead After Spine Surgery. Chin J Traumatol. April 2017. Guerin P, et. al., Incidental Durotomy During Spine Surgery: Incidence, Management, and Complications. A Retrospective Review. Injury. 2011 Jan 18. [Epub ahead of print]. Shaw, J. Incidental Durotomy/Dural Tear. ICD-9-CM Coordination and Maintenance Committee. March 19-20, 2008. Powerpoint Presentation. Williams, BJ, et. al. The Incidence of Unintended Durotomy in Spine Surgery Based on 108,478 Cases. Neurosurgery. Jan 2011.